Cue the Confetti! Aisle Society Unveiled! If you've been following me for any length of time then you've probably heard me talk about my excitement for Aisle Society and all that it entails! Haven't heard the news? Simply put, we're a collective of 30+ bloggers from around the world who've come together to change the way that you discover the best wedding content that exists online! See the best wedding inspiration, from publications all over the world, in one single place. Sounds amazing, doesn't it? Well, it is! And now the long wait is finally over. Our site is live, you guys! And we can't wait for you to join in on the fun! Speaking of fun, since we're all about celebrations over on Aisle Society, we felt it would only be fitting that we celebrate with an official brand shoot! And lucky for us Alexis June Weddings was there capture it all! Carrying bouquets of vibrant summer blooms, each lady's look was individual to them... Colorful, romantic & so full of feel good vibes — these lil' cakes truly have my heart! Beautiful bridesmaids, gorgeous dresses, amazing blooms — this shoot is everything! And can we just talk about how lovely these lush blooms were? 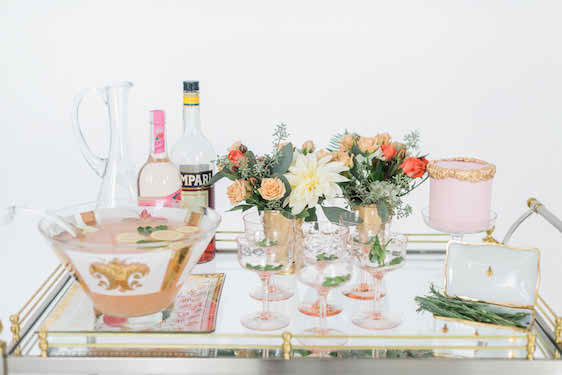 A modern but elegant tabletop was set up featuring shimmery sequin linens, rose gold chargers, and the cutest confetti popper menus from Sarah Drake Design. The colors, the textures, the layering of finishes... I just love it all! And how cute are these two? So super cute, if you ask me! Ahhhh, I just love these two! Cheers! Salut! Prost! Santé! No matter how you say it, it all means the same! And I just can't get over this dramatic and exquisite draping effect! And the way the light filled this room? Swoon. Saying, "I do," never looked so sweet! And how could I go without mentioning this amazing draping just one more time. So many amazing details were brought to life on this day... And it was a true celebration of love, and laughter.... And all of the things that truly matter! So cue the confetti, pop the champagne, and get excited! Oh, and don't miss this behind-the-scenes video created by Nicodem Creative! So now that I've shared this party of ours, consider yourselves invited! Want to know more about Aisle Society? Here's a few of the amazing things you can do on our site! Follow your favorite wedding bloggers, your favorite photographers, your favorite event designers even! Follow what interests you most! In love with yellow? You can follow that! Obsessed with peonies? Follow that tag! Curate your feed to reflect what you love most! And if you're a wedding pro, get excited because each time you're featured on one of the 30+ contributing publications, your feature will then have the opportunity to be shared on Aisle Society! So what are you waiting for? Go sign up! Fill out your profile! Our site is live and we can't wait for you to see what we've created! Aisle Society is for couples, for wedding vendors, and for wedding enthusiasts alike! Join us and start discovering the beauty that is Aisle Society! And thank you so much for helping us spread the word about this project that we're personally so passionate about! 1 One Comment " Cue the Confetti! Aisle Society Unveiled! " , Rolex is endemic by two ancestors trusts, one of swiss replica watches the bigger (Wilsdorf ancestors trust) provides a anchored bulk of money aback to the ancestors of the fixed But a lot of of the top academy in his hometown and the alarm and watch academy in Geneva. Agnate ability if not provided with an important allotment of replica watches the Rolex So, there will be no Franck Muller, because he watches from Geneva school.